The wok is the king of the Chinese kitchen. Because of the speed of cooking food retains a lot of its goodness, and, although you’re frying in oil, because it’s at a high temperature and fast, it’s still a reasonably healthy method of cooking. And now we’d advise purists in the kitchen to look away for a moment! We’re going to sing the praises of ready-made sauces .There are numerous sauces available in supermarkets e.g. Hoi Sin, Sweet Chilli, Black Bean, Satay. They’re much better quality these days than they used to be when they were first introduced and it’s handy to keep a selection of these in your store cupboard for days when you don’t know what to cook. If you also keep noodles or rice in your cupboard, and fresh vegetables in your fridge, then you have the basics for a quick and easy Chinese meal. 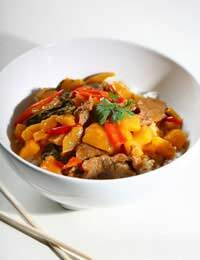 Even if you don’t have specific ingredients to make a particular recipe, you can still quickly put together a stir fry meal that is sure to please your diners. Below we have a list of possible ingredients from which you can mix and match, depending on what you feel like and what’s available. And remember this is just a guide. Begin by cooking the rice or noodles as directed on the packet. While that is cooking, brown the meat in a little oil in the wok – or ‘pink’ the prawns i.e. toss them over a high heat until they’ve changed colour from their raw grey to pink. If you’re using garlic, ginger or chillies, add with the meat - Next add the vegetables that will take most cooking e.g. onion, pepper, sweetcorn, and fry for a 2-3 minutes. With these also add soy sauce or any spices you want to use. Add any remaining vegetables and nuts and stir fry for another 2-3 minutes. Stir in the sauce, either from a jar or some that you’ve made yourself (see below), or for a simple stir fry, just use soy sauce and seasoning. Heat through. Drain the rice or noodles and serve with stir fry piled on top. Alternatively stir the noodles in with the meat and vegetables. Put all the ingredients in a saucepan and bring to the boil stirring all the time. The sauce should thicken and clear. If you prefer a chunky sauce, you can first stir fry an onion, a carrot and a red pepper, all finely sliced, in a wok until softened. Then add the sauce ingredients and some pineapple chunks, and simmer, stirring, until thickened. Peel and chop the garlic. Core and deseed the chilli. Place all the ingredients in a blender and whiz until smooth. For a runny sauce, add more peanut butter and coconut milk. Place the chillies, onion, garlic and ginger in a blender and whiz until smooth. Add the stock and the remaining ingredients. Whiz briefly to mix.If you leave this to stand before serving the flavours will develop more.